Impressive 'mancave' lands 36-year-old from Aberdeenshire the trip of a lifetime. 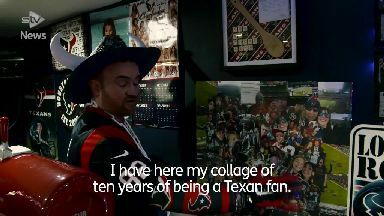 An American football superfan won a trip of a lifetime to this weekend's Super Bowl - and it's all down to the 'mancave' he built in his back garden. 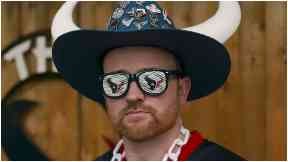 Graham Henderson, from Laurencekirk, Aberdeenshire, is dubbed the 'Kilted Texan' due to his obsession with the NFL side Houston Texans. The 36-year-old built a shrine to the club in his back garden, complete with big screen TVs, signed jerseys and rare memorabilia. 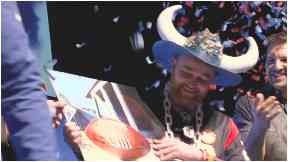 The shed impressed the NFL so much it secured him two tickets to the Super Bowl - the American football championship game of the season. Mr Henderson was presented with the tickets at the NFL UK Live Tour by Sky Sports presenter Neil Reynolds and NFL players Dallas Clark and Ryan Fitzpatrick. He will now fly to Atlanta, Georgia ahead of Sunday's big game between the Los Angeles Rams and New England Patriots. More than 80,000 people will flock to the Mercedes-Benz Stadium and more than 100 million viewers are expected to tune in into the biggest game in the world from home.